The 2018 Youth for Survival Gala, hosted by the Youth Council for Suicide Prevention, is hosting an event focused on education, awareness, and prevention of suicide in the community. This event is on May 4th from 7-9:30 PM, and will take place at the Carnegie Center in Cincinnati. There will be live music, food and drink, inspiring guest speakers, local artwork by area youth, and a silent auction. All proceeds will be used to finance this outreach event and install YCSP satellite groups in schools. 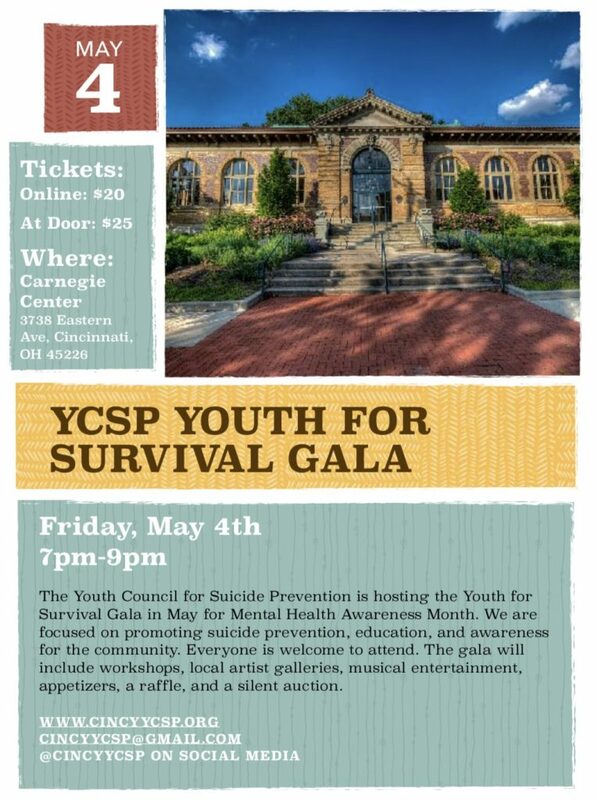 Tickets can be purchased for $20 online (www.cincyycsp.org/youth-for-survival-gala) and $25 at the door.